Learn the secrets of this beautiful, ancient art from German Master Gilder, Karl Eggert. 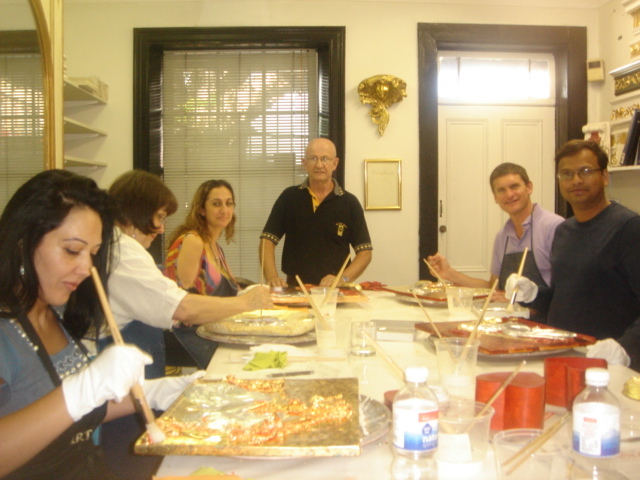 Whether you are a beginner or would like to learn more complex, technical and artistic aspects of gold leafing, the internationally recognised Art Gilding Academy has a course to suit you. No prior knowledge necessary. This short workshop is a perfect, hands-on introduction to gold leafing. At the end you will leave with a beautiful gold leaf covered abalone shell. And for added “wow” learn how to gild Tim Tams with edible 24 karat gold leaf. Delicious! Back by popular demand! This four hour class gives you a chance to dive deeper into this ancient craft. At the end of this course you will be able to apply gold or silver leaf to furniture, frames or artworks. Watch a video of the Discover Gilding Workshop as seen on Channel 7’s Sydney Weekender. In this two day gilding course you will learn how to gild picture and mirror frames, furniture, cornices and entire walls. This weekend course will give you the skills you need to do all of the above and more and is perfect for an artist, decorator, painter or framer looking to add value to their business. This professional nine day course will teach you every aspect about gilding – from studio work to architectural. It would take years to learn what has been condensed into this gilding course. All materials are supplied and students graduate with a certificate. Exclusive membership for Master Class graduates. Lifetime support and discounts on supplies.